Several years ago, the estate of Dame Agatha Christie authorized the brilliant domestic thriller author Sophie Hannah to write more mysteries starring Christie’s infamous character the detective Hercule Poirot. This is now her 3rd attempt, and it’s by far her best. The last two were technically good mysteries but the characters felt wooden somehow. Now, finally, Hannah has come into her own as to channeling Christie’s voice. 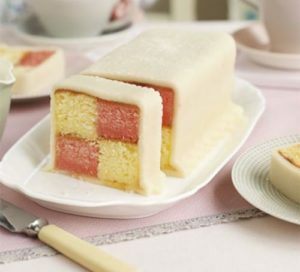 The Mystery of the Three Quarters takes it name from a slice of Church Window Cake (what we used to call Battenberg cake), which has two pink and two yellow squares held together with lemon curd or apricot jam. The cake in question is made by the inestimable Fee Spring, proprietor of Pleasant’s Coffee House, where Poirot has the habit of going. 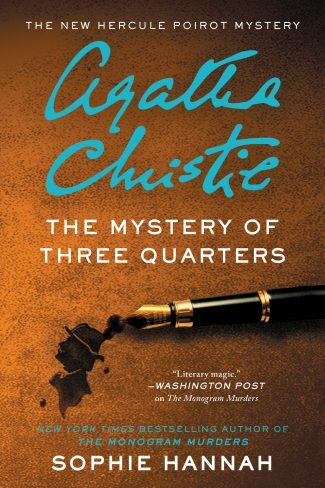 The character of Fee provides a delightful foil for Poirot’s fastidiousness and fussiness, and she enlivens the book. Their sparring allows Hannah’s Poirot to escape the bonds of being someone else’s creation and become at last Hannah’s own. At the beginning of the novel, Point is confronted by 4 different people, two of them furious with him and refusing to listen to reason, and 2 of them more pliable. All of them have received letters typed on the same machine, purportedly from Poirot himself, accusing them of murdering the elderly Barnabas Pandy who recently drowned in his bathtub. Poirot, intrigued, begins the investigate. He soon finds connections between 3 of the 4 people, but thinks that the 4th “quarter” is on his own, as pictured by the cake he’s eating as he ponders this. The thing is, no one thinks Pandy was murdered. He was elderly; he died in his bath; he was discovered by his manservant. Poirot must figure out who wrote the letters and, most importantly, why, if he is to prevent another, actual murder. There are several other little puzzles in the book. Why is a damp dress belonging to one of Pandy’s granddaughters, who lives with him, found taped to the underside of a bed belonging to his great-grandson at his boarding school? Does the fight between his other granddaughter and her daughter have anything to do with the letters? Where is the typewriter that produced them? Does the fourth “quarter” have, after all, a connection to the other 3, or was he chosen randomly? The Mystery of the Three Quarters is elegantly done. It’s a delightful read, quite the best of Hannah’s 3 Poirot novels. Although I miss her domestic thrillers, I can’t wait to read more of her new Poirot mysteries! I love mysteries like this, sort of like brain puzzles. This sounds fun- love the foodie tie-in too! Added to my Goodreads-thank you!